The focus in this class will be on florals. 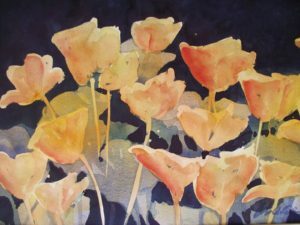 Students will learn to successfully paint flowers in watercolor using basic shapes and brushstrokes. Watercolor can be elusive and challenging. John Erwin instructs in a way that creates successful paintings. In this class students will learn the basics of color and design to create well balanced paintings. John will instruct on how to start and complete a painting. Each week students will build techniques and skills to help guide them into more complex, finished paintings of flowers.